You cannot Special Summon monsters, except “Qli” monsters. This effect cannot be negated. Once per turn: You can pay 800 LP; add 1 “Qli” card from your Deck to your hand, except “Qliphort Scout”. An error has occurred while executing C:\sophia\zefra.exe – Unknown publisher. Qliphort Scout, the card that single-handily raised the price of “Summoner’s Art”. That vanilla search card shot up at the speed of light once Scout hit the market. The card that made the Qli deck go, Scout was a card I was desperate to see hit the ban list. You can only Special Summon Qli monsters while it is a Pendulum Monster, but that isn’t going to matter. 800LP for a search of any Qli card was a killer for the opponent. You’d play Scout, search, then bounce it back to the hand (standard was Performapal Trampolynx), then play it again and get another search. This card was key in setting up your scales first turn and dropping Towers, all but ending the game before your opponent could even play. Saqlifice made this even tougher to stop. If they lacked the number of monsters to tribute for Towers, they could search Saqlifice and equip a Qli monster and there you go, two tributes off one monster. Qliphort Monolith being searched and used as a scale gave you the added benefit of drawing off how many tributes you made that turn. The search ability was devastating. Nowadays we have more hand traps and cards to stop it, but back then, there was hardly anything that could prevent this first-turn devastation. With it at 1 and Towers banned, the dead is all-but dead. If it went back to 3 though…you could see the deck see some play again. They could do a lot with those Pendulum Summons and easy searches via Scout. This card is an example of why effects should be a “hard” once per turn. Qliphort Scout has terrible stats, but that doesn’t matter. Its Pendulum Effect lets you pay 800 LP to search any Qli card once per turn. If it bounces back to the hand or if you have multiple Scouts, you can keep paying and keep searching. Towers is banned, so the deck isn’t as strong as it used to be. But when new support becomes available, Scout will be live and proud. It isn’t really an engine card because you can only Pendulum Summon Qlis while it’s out, but that doesn’t matter. Play as many as you can while you can. To represent the Qliphort archetype, I chose the most iconic card from the archetype, the King of Pay 800, Qliphort Scout. Scout is a Level 5 Earth Machine with 1000 ATK and 2800 DEF while having a Scale of 9. Good high scale, being Level 5 and Normal gives you Summoner’s Art, ATK is terrible, DEF is great, type is ok, and attribute is great. 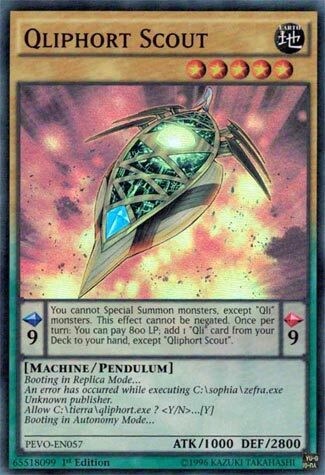 In the Pendulum Scale, you cannot Special Summon non-Qli monsters. You are most likely playing this in only Qliphort, and they don’t run other main deck monsters they actually summon excluding Qli monsters. Once per turn, you can pay 800 to search for a Qli card. Great searcher for the deck, the reason why the TCG has it limited. The OCG is lucky, or unfortunate, enough to have it at 3 still. The card is key to the Qliphort deck, play every copy you are allowed to. Oh yeah, the monster effect… there isn’t one. Still a great card. Next article[Stock Market] Is A Crash Coming?